This page shows the latest Flutiform news and features for those working in and with pharma, biotech and healthcare. Why skills and flexibility matter more than sheer size. 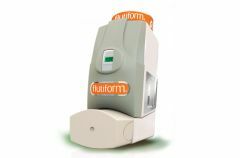 Skyepharma and Mundipharma collaborated on the respiratory drug Flutiform. ... was able to make decisions quickly and was equally committed to the success of Flutiform. Treatments successfully brought to market in this way include asthma treatment Flutiform, created by Skye Pharma, and restless legs syndrome treatment Targin.